For those who have to endure endless presentations and lectures this proposal by Switzerland's Anti-PowerPoint Party to outlaw PowerPoint presentations. Poehm believes that the software takes people away from their work and teaches them little. "There is a solution," he says. "A flipchart." On leaving academia seven years ago I vowed that I would never use PowerPoint again. I still speak at conferences, though, and have been known to rant at organisers when asked in advance for my PPT presentation. I inform them that I will be turning up with a set of index cards on which I have jotted down key points, but will not be boring my audience to tears with fiddly slides consisting of flying text, fussy fonts or photo montages. Call me old-fashioned, but I believe in having a real discussion about ideas as opposed to force-feeding an increasingly sleepy crowd with numerous graphs and bullet points projected on to the nearest wall. Sometimes I wonder why we even bother showing up to hear a colleague elucidate on their thesis, when we are helpfully posted an advance printout of the presentation. As the speaker is building to a crucial statistic, delegates have long finished and are doing the crossword instead. This may just be an anti-technology thing or soembody with a passion and a bee in his bonnet taking advantage of Switzerland's bizarre political system, but I am sure there are more important issues to take up. Perhaps we will have to put up with annoying powerpoint presentations for some time whilst we devote our energies towards sorting out the economy, education and health instead. Further to my article yesterday in which I suggested that the only way to reduce the cost of housing was to build more, the National Housing Federation has joined in with a similar argument in this morning's Western Mail. Estate agents in Wales say the country’s housing market is suffering from a shortage of new homes, with many first-time buyers still failing to get on the property ladder. David Orr, chief executive of the National Housing Federation, said: “With home ownership in decline, rents rising rapidly and social housing waiting lists at a record high, it’s time to face up to the fact that we have a totally dysfunctional housing market. Home ownership is increasingly becoming the preserve of the wealthy and, in parts of the country like London, the very wealthy. The Home Builders Federation estimates that there are 100,000 Welsh families on housing waiting lists, with first-time buyers needing an average deposit of around £30,000. They say that only 918 new homes were registered in the first three months of the year, compared to 1,120 last year, despite rises in housebuilding across the UK. He said that while the housing market has been active in buy-to-let and high-end sectors, the lack of first-time buyers has had a significant impact. “The whole market is driven by first-time buyers – it’s driven from the bottom,” he said. “There is a whole chain effect that goes to the top, but it all starts with the first-time buyers. “The amount of deposits required from first-time buyers is beyond the reach of most people. When you’re asking for a young couple to come up with a £40,000 deposit, they just can’t get that type of money. In contrast an article later in the paper compares the proposed development of thousands of new homes to the Norman Conquest and the consequent threats to Welsh language and culture. One of the issues raised is how the targets for new housebuilding in Local Development Plans are set. The argument is that they are imposed from the Welsh Government, which I believe is correct. Presumably, the government have used the research I referred to yesterday as their guide. That leads to a lack of transparency and accountability. It seems to me that if we are to resolve this issue then there needs to be much more local and evidence-based control over these housing targets. Only then can we get communities to buy into plans and only then can we start to deal with the affordability problems caused by the shortage of housing for certain groups across Wales, especially first-time buyers. The BBC report on further revelations from behind the scenes on the decision to invade Iraq that add to the case against Tony Blair and his government. They report former MI5 boss Baroness Manningham-Buller as stating very clearly that Iraq posed no threat to the UK when Tony Blair took Britain to war in 2003. She added that the service advised war was likely to increase the domestic threat and was a "distraction" from the pursuit of al-Qaeda. There was some joy on the internet yesterday that the Observer had managed to report accurately on an important Welsh issue without patronising us and without alluding to a view commonly held by desk-bound London journalists that Wales is a country of coal mines and heavy industry. Alas that time is in the past. The article in question referred to the controversy over Carmarthenshire's Local Development Plan, which is proposing 11,000 new homes over the next decade or so, including 1,200 on the edge of Carmarthen itself. That would produce a 20% increase in the size of the town. They say that the fear among many locals is that the majority of the people moving in will not speak Welsh, a change that would pose a "huge threat" to the language. In my view that is a legitimate concern and one that needs to be addressed, not least by the policy of linguistic impact assessments. It seems to me that any policy which will produce so many new houses needs to have a robust evidence-base that can show there is a local demand for them. My instincts tell me that 11,000 are too many for that particular area but let us make that judgement on the basis of the facts. Equally as important though is the wider housing crisis facing Wales, which does need to be addressed. The Welsh Government's own research says that an estimated 284,000 additional homes are required in Wales between 2006 and 2026. 183,000 of these would be in the market sector and 101,000 would be social housing. That is an average of 14,200 new homes a year of which 5,100 need to be affordable. We have already fallen behind that target by 9,500 homes. The Carmarthenshire proposals need to be put into that context. But this is not just about new homes, it is about affordability for local people wishing to stay in their own communities. Market forces dictate that if there is a shortage of housing then the price will go up and that will often price local people out of the race for the few homes that are available where they live. If we are not building social housing, and remember the Welsh Government budget has been cut drastically for this purpose this year, then people have nowhere to go. They will often move out of their own community and that will have an equally devastating impact on the language. That is especially so when better resourced outsiders buy up those properties that are for sale. Not building new homes can cause communities to lose cohesion as well. This is a a very difficult tightrope to tread. We are concerned to maintain our environment and our culture by opposing excessive development, but if we do not meet the demand that is there then newcomers will pick off existing homes as they come on the market and the next generation will not be able to afford to live locally, even if they can find somewhere to buy or rent. We need to build new homes for sale or rent, both in the private and public sectors if we are to bring down prices. It is the only way that we can make housing affordable again. How we do it though is a challenge we have yet to meet. The accident that led to Swansea City defender, Alan Tate breaking his leg is a terrible blow for the football club and the City. I hope that he gets better soon. Crashing a golf buggy is a bizarre and rather freak way to suffer such a misfortune. Having said that I am beginning to come around to the view that the humble golf buggy is attaining a much more significant place in the annals of Welsh sport than it deserves. After all this is not the first time that a major sports figure has hit the news after a misadventure with one of these vehicles. Carmarthen East and Dinefwr MP, Jonathan Edwards is not one to demonstrate self-doubt, nor does he appear to be a politician prepared to compromise on his principles. He is an MP cut out to be in opposition and embraces that concept at every opportunity. This morning's Independent article calling for him to lighten up a bit, is hardly likely to cause Mr. Edwards to lose any sleep. However, it does underline a growing problem with Plaid Cymru, that the rediscovery of their traditional values of independence and the Welsh Language as their main rationale is undoing the careful repositioning of the party in 1998-1999 and marginalising them back into their heartlands. The reason for the advice to Mr. Edwards to chill-out is his complaint to the Police and basically anybody who will listen or who have some sort of statutory role, about Roger Lewis' review of Jasper Rees's book, Bred of Heaven. In that review Mr. Lewis inaccurately described Welsh as "an appalling and moribund monkey language, which hasn't had a new noun since the Middle Ages". There is no doubt in my mind that this view is both unnecessarily offensive and ignorant, but at the end of the day the book reviewer is entitled to his opinion and, let's face it, he only lets himself down by expressing it. Rhondda Labour MP. Chris Bryant agrees. He is quoted as saying: "Roger Lewis's piece is fatuous nonsense, but the last thing people want is a moaning version of Welsh nationalism. Wales is at its best when it is triumphantly insouciant about the criticism of others, and if we can't take a bit of scabrous attack without running to the police, it's a sad day for Wales." Meanwhile, Lembit Őpik takes a break from his campaign to be the Liberal Democrat London Mayoral nomineé and jumps in with the verdict that 'people have the right to hold objectionable views'. It is a shame Lembit did not embrace that philosophy when he wrote to me to complain about my championing of the poet Patrick Jones in December 2008, by staging a poetry reading in the Welsh Assembly. Lembit goes on to say: "The best way to promote the Welsh language is to promote the positive, not to prosecute the negative. It can look a little bit oversensitive. He needs a reality check. If I had tried to prosecute people every time I didn't like what they said, I would have become a barrister." We are very fortunate indeed that Lembit does not resort to lawyers or criticise the press when he takes exception to what people write about him. Other personalities who take a contrary view to Jonathan Edwards are Carol Vorderman, Gyles Brandreth and Stephen Fry. In a contest of celebrity the MP is outclassed. But he is also wrong to overreact in the way he has. The book reviewer is Welsh himself and was attempting a bit of humour. He may have gone too far and even missed the mark completely, but that is life. After all if we cannot take a bit of banter as a nation then we really are in trouble. Is it me or does the cat have a Welsh accent? One of the constant refrains of the left is that the Government should be closing tax loopholes and going after tax dodgers rather than cutting public expenditure. Well, as this article in the Independent shows, not only is this happening but it is not as straightforward as is claimed. The paper says that Panama and the British Virgin Islands will be Chancellor George Osborne's next targets as he extends his crackdown on tax havens used by rich Britons to salt their assets away. They add that HM Revenue and Customs will aim to reach information-sharing agreements with Panama and the Virgin Islands similar to the one with Switzerland announced on Wednesday which will net the Treasury more than £5bn in unpaid tax. To be fair this was work started by Gordon Brown but the present Government's pursuit of the agenda is equally as committed to maximising income to the Exchequer. However, its success depends on international cooperation and a willingness by other countries to work with the UK on this. As a result we do not always get everything we want. I agree with Nick - again! There are two stand-out articles from yesterday's press that show Nick Clegg and the Liberal Democrats have not lost their reforming zeal, nor are they going to be pushed around by the Conservatives. The first of these is Nick's determination to finally nail down reform of the way political parties are funded. According to the Independent, the Liberal Democrat leader is considering ideas including a £50,000 cap on individual donations to parties so they do not rely on rich backers. In return, parties could qualify for tax relief on small donations in the same way as charities. The paper says that Clegg insists that he wants to reach an all-party consensus, however, he does not rule out legislation if no deal can be reached. The final Government proposals will be finalised after an independent inquiry into political funding reports in October. The Labour government that passed the Human Rights Act then spent years trashing it, allowing a myth to take root that human rights are a foreign invention, unwanted here, a charter for greedy lawyers and meddlesome bureaucrats. This myth panders to a view that no rights, not even the most basic, come without responsibilities; that criminals ought to forfeit their very humanity the moment they step out of line; and that the punishment of lawbreakers ought not to be restrained by due process. The reality is that those who need to make use of human rights laws to challenge the decisions of the authorities are nearly always people who are in the care of the state: children's homes, mental hospitals, immigration detention, residential care. They are often vulnerable, powerless, or outsiders, and are sometimes people for whom the public feels little sympathy. But they are human beings, and our common humanity dictates that we treat them as such. It was, for example, of no help to anyone when police spokespeople blamed human rights for a decision to deliver a KFC meal to a fugitive on a roof: this had nothing to do with the Human Rights act. There is no human right to fried chicken. So, as Cameron has said, we need to "get a grip on the misrepresentation of human rights". Too many people have succumbed to a culture of legal paranoia where common sense decisions are questioned – not by the courts, but by overcautious lawyers and officials. This creates an ever-worsening cycle: the more we perpetuate the myth that, in the words of Jack Straw, human rights are a "villains' charter", the more those dealing with lawbreakers curtail their behaviour because of a general sense that rights trump common sense. The friends of human rights have the most to gain if we get a grip on this. We must give public officials back the confidence that reasonable decisions taken in the public interest will be defended by the courts – as they usually are when they actually reach the courts. He points out that: Court judgments themselves tend to tell a very different story about our rights culture than tabloid papers. The Human Rights Act and the European convention on human rights have been instrumental in preventing local authorities from snooping on law-abiding families, in removing innocent people from the national DNA database, in preventing rapists from cross-examining their victims in court, in defending the rights of parents to have a say in the medical treatment of their children, in holding local authorities to account where they have failed to protect children from abuse, in protecting the anonymity of journalists' sources, and in upholding the rights of elderly married couples to be cared for together in care homes. He concludes that as we continue to promote human rights abroad, we must ensure we work to uphold them here at home. He says that we have a proud record that we should never abandon. It is an article that the News Statesman rightly suggests is a much-needed contribution to the public debate on the matter. They go on to suggest that Ed Miliband might be wishing that he had written it. Indeed, given Labour's record on civil liberties it would be useful to know, does Ed agree with Nick as well? Welsh Government is so macho! An extraordinary row has broken out between Welsh Ministers and the Leader of Pembrokeshire County Council over two critical inspection reports. The Welsh Government has accused the Council of trying to play down the reports' seriousness in some media interviews. But Pembrokeshire Council leader John Davies hit back by alleging that some comments in a letter from ministers were factually inaccurate. He later told BBC Wales he was concerned with how the Welsh Government dealt with the matter and accused ministers of turning it into a political and personal issue. "In my view, this is no way to run a country, it's no way to deal with issues," said Mr Davies. "We have got issues in Pembrokeshire, as far as safeguarding of children, and what I've witnessed as far as the commitment of those working... in schools and indeed within the main body of the council, we are very keen to put it right. "We need to put it right. There's no excuse not to put it right." Asked about accusations of playing down the reports' seriousness, he said the council had admitted deficiencies but had also "put a bit of context and, indeed, moderate some of the issues in relation that had been highlighted". Clearly, the issues raised by reports of these kind need to be addressed but do we really need Ministers playing at macho politics? There have been a number of high profile interventions of one sort or another in the last year or so. In each case the Minister has reacted to poor reports by inspectors and yet it is difficult to escape the conclusion that the flexing of muscles on the part of the Government is more than just about driving forward improvement. Legislation has been put in place to allow more and more intervention. The respect for local democracy that used to exist in the Assembly's early days has disappeared. Now it is about direction and control. Slowly but surely the Welsh Government is gathering more power to itself and limiting the room that local Councils have for manoeuvre. They are paying lip service to the notion of local democracy. And by using poor performance as the raison d'etre for this approach Ministers also manage to distract attention from their own failures. Should somebody not be inspecting the Welsh Government in the same way and threatening intervention where they are getting it wrong? I bet they would not take it lying down? This morning's Western Mail contains a substantial article detailing the views of Swansea-born Michael Heseltine that a new wave of directly elected Mayors would stop a new wave of riots. Mr. Heseltine believes that these Mayors will provide leadership to drive through change. Although I agree with him on the need to better empower local Councils to deal with problems in their area, I am on the same side as Plaid Cymru Arfon MP Hywel Williams, who opposes the idea of transferring power into one person’s hands without checks and balances. The idea of one individual riding to the rescue of an area on a white charger is a romantic notion not borne out by the facts. From what I can see, apart from a few exceptions an elected Mayor has no more beneficial impact on a community than a competent Council Leader elected in the standard way. As for the riots, we should not forget that one of the worst hit areas was London and they have an elected Mayor! The Welsh Government has published its annual report giving details of any gifts received by Ministers, Special Advisors and Trips Abroad here. The information relates to the financial year 2010-2011. There is nothing exceptional about this information apart from two items. That is that of the total spent on Ministerial overseas visits in 2010-2011 of £25,351 more than half was spent on just two trips. The first was the well-publicised and criticised trip by the former Environment Minister, Jane Davidson to the Climate Change Conference in Cancun. She took two officials with her on 4 December 2010 at a total cost of £11,926. The second was a trip by the then Counsel General to Entebbe, Uganda unaccompanied by officials (an official was already in attendance) on 22 October 2010 at a total cost of £2, 216. I am not clear what either trip achieved. Does anybody else know? I am guessing that when politicians are asked to complete pro-forma questionnaires for magazines and other publications the idea is to get some insight into their character. What ambition would you most like to fulfil? "My main ambition is to do my best to help all my constituents in any way that I can." What has been your best moment? Getting elected. What has been your proudest moment? Getting elected. What is the best advice you have received? To seek election. I hope he does not get any splinters sitting on that fence. This morning's Daily Telegraph is quite rightly exercised by news that Town hall chief executives have seen their pay packets rise by as much as £17,000 while cutting front-line services, including libraries, care for the elderly and bin collections. They include chief executives who won plaudits by publicly announcing that they would slash their salaries last year but have instead replenished their pay packets with bonuses, allowances and perks. Ministers last night reacted angrily to the disclosures. Grant Shapps, the local government minister, said: "It is astonishing that it appears chief executives are finding elaborate ways to hike their pay through the back door. "A culture of bumper pay and perks has no place in local government especially during these tough times across the public sector. Cutting pay is one thing chief executives can do to demonstrate a personal commitment to protecting the front line. I urge them to do the right thing and lead from the front." The paper adds that of the 25 highest paid council chiefs, 16 were given pay rises. To be fair, despite the bad impression given, this is really none of the Government's business. It is up to the Councils themselves to set the rates of pay of their employees and they are answerable to the local voters for how they do it. Equally, the comparison with the Prime Minister's salary is not really valid as firstly, he receives much less than the job is worth for political and presentational reasons and, secondly the job is different to that of a local Council Chief Executive both in terms of function and responsibility but also in terms of the marketplace from which applicants are drawn. Nevertheless, it is highly insensitive for any Chief Executive of a local Council to be receiving increases of this magnitude whilst their employees are having their wages reduced or frozen and services are being cut. Councils and Councillors really do need to look again at this issue. 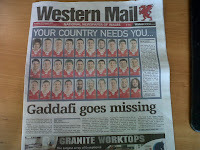 The front page of this morning's Western Mail uses up two thirds of its space with individual pictures of the Wales Rugby Union World Cup Squad above the headline 'Gaddafi goes missing'. 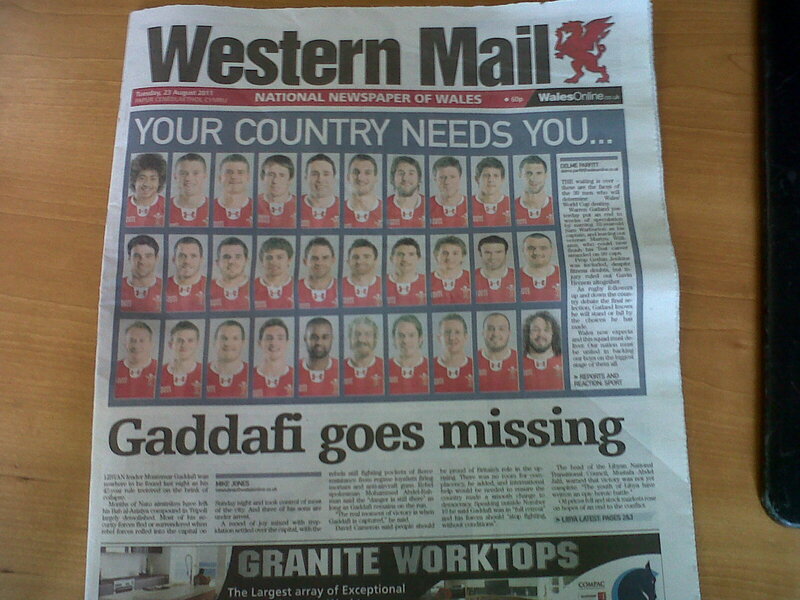 Personally, I had not expected to see Gaddafi in the squad though there was some expectation that Martyn Williams might be there. Maybe it is just me. I have blogged before about Prince Charles using his position to secure privileged access to Government Ministers so as to promote his own agenda. I do not dispute Charles' right to hold a point of view or even to express it publicly but I do find the abuse of privilege indefensible from someone who is not elected or accountable for his actions. However, this morning's Guardian is woefully wide of the mark when it starts to target Prince Charles' charities for lobbying government ministers and senior officials to change policies on politically sensitive topics including VAT rates and regional development spending. After all that is their job and they are not, as far as I can see, using privileged access to get their message across. A lot of charities and third sector bodies do precisely the same thing. Just because these charities are linked to Prince Charles does not mean that they should behave differently or conform to another set of rules. On this occasion the Guardian's criticism is wrong. At a time when Wales is seeking to pull itself off the bottom of the UK economic league table, when its education system is underfunded and failing international comparator tests, and when the health service is under huge financial pressure and providing worse outcomes than England on cancer and other illnesses, it is interesting to see the new Welsh Tory Leader has his finger on the pulse of the nation. Andrew R. T. Davies has chosen to major on a plea to reintroduce fox hunting. I do not think I need to say that this is hardly the subject on most people's lips at the moment, nor would it be their first priority for Parliamentary or government time. In fact the ban on fox hunting had overwhelming backing in Wales and as far as I am aware retains that support. It is difficult to see therefore what the Welsh Tory Leader hopes to gain by promoting a new vote so prominently, other than perhaps to shore up his support amongst a select band of people in rural communities. It is not that I am complaining. If the Welsh Tories want to make themselves even more irrelevant to the electorate then they are already then who am I to object? The news that Ofgem is to bring in forensic accountants to scrutinise how the Big Six energy suppliers calculate their profits is very welcome. In March, Ofgem published a review of the retail market and later queried the transparency of five of Britain’s biggest utility companies – Scottish and Southern, Scottish Power, RWE npower, EDF and E.ON – in financial information provided to the regulator. For their accounts submitted to Ofgem for 2009, the regulator believes these companies may have included £800m of profits from their supply and generation businesses under a variety of other headings in their accounts – mostly as exceptional items. The utility companies have all strongly denied any suggestions of opacity in their reporting, saying they gave a “true and fair representation of retail margins”. Subsequent accounts for 2010 have more clearly divided all profits into either generation or supply divisions. However, the Big Six, which also include British Gas, are increasingly under the spotlight over their decision to raise gas prices by 16pc to 19pc and electricity prices by 7pc to 16pc this summer. EDF Energy is the only one so far to have held off increasing bills for the second time in nine months. This is something I have been saying for some time. With consumers facing unprecedented bills for energy consumption it is vital that Ofgem get to the bottom of the energy companies' excuses for eye-watering price rises. Customers have suffered too long and deserve some protection. It is a big day for Swansea, the Swans' first home game in the Premiership. To mark the occasion we have our trademark August rain, but also the prospect of Max Boyce kicking off the game with a rewritten version of 'Hymns and Arias'. The original lyrics are here. I cannot wait to hear the revamped version. Sunday sees a gathering of a different type with a floating flotilla protesting against the closure of Swansea Coastguard Station. 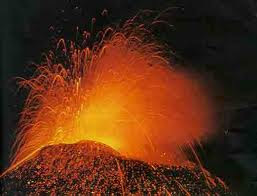 I will be there but plan to keep my feet on terra firma. If anybody ever doubted that the forthcoming London Mayor election was going to be anything but a huge clash of egos between Ken Livingstone and Boris Johnston then this Independent piece should rapidly bring them back to reality. The author, Andy McSmith writes: In Dante's Inferno, the ninth and innermost circle of hell is reserved for those who have committed vile acts of treachery against people who had reason to trust them, such as Cain, and Judas Iscariot. And into that same terrifying pit of fire will be cast those London voters who commit the unforgivable act next May of not voting to return their former mayor, Ken Livingstone, back into the office he loves. At least that is how things stand if you believe Mr Livingstone. The 66-year-old is living up to his reputation for unpredictability and a love of attention by threatening eternal damnation on residents of the capital who fail to give him their vote in his forthcoming showdown with Boris Johnson. He also suggested that the mayoral contest between him and Mr Johnson will be the clearest choice between right and wrong since Winston Churchill took on the Third Reich. "It's a simple choice between good and evil," Mr Livingstone said. "I don't think it's been so clear since the great struggle between Churchill and Hitler. "The people that don't vote for me will be weighed in the balance, come Judgement Day. The Archangel Gabriel will say, 'You didn't vote for Ken Livingstone in 2012. Oh dear, burn forever. Your skin flayed for all eternity'." Even as a joke that is appallingly bad taste and should give pause to Ed Miliband as to whether he really wants this man representing his party next May. Ken has also compared Boris Johnson's chief of staff, Edward Lister, to the Serbian war criminal Ratko Mladic. Hopefully, these over-the-top comments will give Londoners pause for thought and they will opt instead for a candidate who is serious about how he or she portrays London to the outside World. When will the Liberal Democrat selection process be completed? Have the Welsh Tories changed their policy on policing in Wales? I only ask because when Labour were proposing a single police force they were at the forefront of the opposition to the idea arguing that it was inappropriate and costly. Now, a prominent member of the Welsh Conservative Assembly Group is calling for precisely that. Byron Davies, Conservative Assembly Member for South Wales West, has said that savings can be made by having fewer chief constables. He has suggested that by merging forces, the money that is saved could then be spent on employing more frontline officers. In actual fact it was quite clearly demonstrated last time that amalgamation would cost money that would not then be recouped in savings. By all means let us have a debate, but can we clarify if Mr. Davies is speaking for his party on this or not first? I am not sure if Andrew R.T, Davies is going to be an accident-prone leader of the Welsh Conservative Assembly Group or not but this cannot be a good start. This morning's Western Mail reports that he has come under fire after it emerged he claimed expenses for a promotional video about his work as an AM. They say he has received reimbursement of £195 from the Assembly in February for the video, which is still available on his website. At the time it was seen as part of a potential leadership bid by Mr Davies, who resigned as Shadow Health Secretary last November after an apparent fall-out with the then group leader Nick Bourne which was never explained. Clearly, that was not the case otherwise he would not have claimed for it. Still it looks like a bit of an own goal. At least Mr. Davies has not suffered a black eye after falling in a shower yet. There is a serious and substantial analysis from Professor Dave Adamson in this morning's Western Mail of the problems facing many Welsh communities, which he says are as critcal as those in English cities, which suffered riots last week. It is a marked contrast to the opportunistic and shallow warnings offered by the First Minister yesterday. Professor Adamson says: “We have created a poorly educated, unemployable, disengaged and alienated youth who do not even understand the culture of wider society let alone share it. He continues: “We need a root-and-branch challenge to the culture of disengagement and disconnection which has settled over our poorest communities. This begins at the community level, involves our schools and youth services and requires a future of meaningful employment for young people. Mr Adamson warns that in “post-industrial communities” young people have been allowed to become cut off from wider society with violent results. He writes: “Segregated in housing estates and inner city enclaves, cultures have emerged which deviate from the wider social norms and which grow increasingly violent and sociopathic. The rash of youth shootings and stabbings in London over the past five years were the warning signs of the distance sections of British youth had travelled from the mainstream values and behaviours of wider society. Mr Adamson argues that the true threat to society is greater division between rich and poor. He writes: “We have heard much in recent years about the ‘broken society’, of hoodies roaming estates submerged in a culture of drugs, gang violence and petty crime. However, the true breakage is one of polarised inequality in which the distance between rich and poor has grown exponentially in monetary terms but also more fundamentally in terms of the social experience of life in the UK. These problems have not developed overnight of course. They are a mark of the failure of the Welsh Government to tackle the major problems of social exclusion, poor housing, poor transport links and poor opportunity. Equally, it is a damning indictment of their failing social policies, the lack of investment in education and training and of course the fact that under 13 years of Labour the gap between rich and poor actually increased. But this should not be a blame game. We now need to urgently devise long term policies to deal with these problems. In particular we need to substantially reform flagship programmes such as Communities First where they are failing and invest money into improving opportunities for young people. We need to empower communities and service providers to make decisions, not seek to dictate to them from the centre, and we need to give local Councils and other agencies the tools they need to rejuvenate their economies. Wales can benefit from greater powers, not least in the ability to reduce corporation tax, reform the Barnett formula and other fiscal aids. The Minister should be going to Westminster to make the case for that at every opportunity. Above all though, we should not lose sight of the one factor that is missing in Professor Adamson's analysis, that is that respect and engagement goes both ways. Poor social factors are not an excuse for criminality. It is the job of government to constructively focus discontent, it is the role of each citizen to respect the laws of the society they live in and abide by them. As if we needed further proof that we are still in the silly season, this morning's Western Mail leads on claims by the Welsh First Minister, that Conservative-Liberal Democrat polices are a threat to both safety and employment in Wales. The fact that Labour don't have an alternative other than the sort of reckless behaviour they indulged in between 2000 and 2010 that got us into this mess in the first place is glaring. Their refrain that cuts are too deep and too fast do not stand up to scrutiny when compared the Alistair Darling's plans, which were very similar. Equally, Labour's attempt to assume the moral high ground on cuts to the police service fails when one considers that they did the same thing. As for unemployment, well here in Wales it rose under Labour. It is now falling. Nobody knows for certain what will happen in the future, least of all Welsh Labour politicians, but the evidence so far is that the present Government is making a better job of handling these matters than Blair and Brown, who created many of these problems anyway. Sergio Aguero, who scored two goals for Manchester City against Swansea last night cost the club £38 million. That is more than the cost of building Swansea's Liberty Stadium. The most bizarre story of the weekend has to be this one in Saturday's Western Mail, where South Wales Police are objecting to Cardiff council plans to bring a major Doctor Who tourist attraction to the capital. The paper says that the exhibition is expected to attract 250,000 visitors a year, generate revenue of up to £6m annually for BBC Worldwide and pump £65m into the city’s economy. But South Wales Police say the exhibition will increase policing pressures, and they have warned they will object to the plans unless the council funds a new Police Community Support Officer. Planning Officers have rejected the demand on the grounds that the venue will be employing its own security. It is fortunate in some ways that it is not a Torchwood exhibition. The cost of cleaning up Cardiff Bay after the team blew it up in the last series must have been huge. That really would be a policing nightmare. This morning's Observer records the growing row within the coalition as to how to deal with the hundred plus people who were arrested and charged with offences following last week's English riots. They record that the Liberal Democrats are pressing hard for an end to "kneejerk" reactions by politicians and are warning that stripping those involved of their benefits could worsen crime on the streets. Writing in the Observer, he says: "We need to demonstrate ambition to have a responsible society where all people understand and are aware of their obligations to each other. This means we must not cut taxes for the rich or take away public support for the needy." Referring to plans, backed by many Tories, to cut benefits and evict families of rioters and looters from their homes, Hughes, whose south London constituency of Bermondsey and Old Southwark has one of the highest concentrations of council homes, adds: "We should be careful not to rush into kneejerk solutions including over-hasty moves to change the social contract and approaches to sentences which may have the reverse effect to that intended." As Lib Dem leader Nick Clegg also cautioned against "kneejerk" reactions, Hughes's comments were backed by the Lib Dems' welfare spokeswoman, Jenny Willott, who said she was "very worried" about moves to cut benefits for those involved in the riots, when the same punishment would not apply to others who had committed equally serious offences. "One obvious problem would be that if people don't have money they would turn more to acquisitive crime. I completely understand people's desire to stamp out the problem, but it is important that we do not make things worse," Willott said. They are both absolutely right. No matter what the causes of the disturbances, we have to think about future community relations and cohesion. Punishment for wrongdoers has to be appropriate. We will achieve nothing by resorting to punitive penalties that create yet more social problems. Death of the silly season? With all the newspapers dominated by the very serious consequences of the riots of which, more later, it is little wonder that many of them are heralding the end of the silly season. After all, what news editor even has room for the traditional holiday fillers? The Wales on Sunday is no exception with columnist, David James pronouncing that "The silly season - beloved by tabloid newspapers, growers of unusually shaped vegetables and the owners of humungous pets - has died." How fortunate then that Wales' very own Sunday paper has the exclusive on such hard news stories as "Henson faces tough decision in TV dating show", "Girls from Wales can now claim to be the most beautiful around", "Massages for civil servants", "Was it Jack Dai Ripper", "Oh Mein Gott...It's Her Hitler! ", "Love..from Dud to Stud", "Wacko Jacko still alive", "Wales' National football team has been left out in the virtual wilderness - after being snubbed again by the makers of a flagship computer game", and "My secret weight war". But who am I to complain? It is why I buy it. I am back from rest and recreation in sunny Italy to another form of R&R, though thank goodness, the riots in England seem to have dissipated. This is not going to be a blog post looking at the causes of those disturbances. I have read much since getting back home, but I do not live in the affected cities and can not hope to understand the motivations of those who took part. That has not stopped some politicians from using them to make political points, no matter how cheap. People like Peter Hain have their crystal ball out again. He is predicting years of unrest, unchecked by a rapidly diminished police force. That is not to say I disagree with Peter Hain on the potential weakening of the police by cuts. I just want to see the evidence and hear for myself before jumping to conclusions. Peter Hain has put the disturbances down to 'economic frustration'. He may be right but that frustration has been long in coming and it does not excuse criminal behaviour. Perhaps, the Shadow Secretary of State for Wales should be clearer in making that distinction too. In an attempt to understand this agenda better I suggested a short inquiry into police cuts by the Communities, Equality and Local Government Committee of the Assembly next term. I requested that we get the Chief Constables themselves to give evidence. We will then have an informed view of how the Police are dealing with the cuts and to what extent they are being absorbed by the sort of reorganisation suggested by the Wales Audit Office last year, when they identified savings of £14 million though civilianising police tasks, and between £24 million and £35 million in other efficiencies that could be made without hitting front-line policing. What I want to know is how will these cuts affect front line policing? Despite asertions by many politicians I do not think that this is in anyway clear as yet. What has also not been acknowledged is the history of cuts in the police budget. It is not the case that the police were suddenly forced to make savings at the moment that there was a change of government. If we look at the figures, between 2007 and 2010, for example, we will see that there was a cut of nearly 200 in front-line police officers in Wales. That was before the coalition Government came into being. If we look at the 2010/2011 funding settlement, under the previous Labour Government, we will see that it cut £125 million from the money available to police forces. The cumulative impact of the decisions by the Home Office and by central Government which, under Labour, also cut the police grant, means that we are now in a situation where the amount of money that the Welsh Government puts into the police forces is proportionally higher than the amount of money that they get from the Home Office. Add to that the fact that the Welsh Government has applied stricter capping criteria than in England and have prevented Police Suthorities raising as much as they want from Council Tax then it is little wonder that budgets are stretched. The proposed cuts in Welsh police forces are worrying, but let us not kid ourselves that this automatically means a bleak future of lawlessness on our streets. There is a long way to go yet before we can reasonably come to that sort of conclusion and hopefully we will not get there at all. How do you parody Jacob Rees Mogg? The BBC reveal that the irrepressible MP for North East Somerset, Jacob Rees Mogg is trying to close down a Twitter account set up in his name. Some of the tweets on the "JakeReesMogg" account, which has 1,498 followers, appear to parody the Old Etonian MP. One reads: "Our 3 year old killed a pheasant this morning, leaving me with a terrible dilemma: What does one do with an out of season bird?" Another tweet soon followed: "Probably worth pointing out that the three year old referred to in my previous tweet is a labrador and not a human being." The imposter also offers words of wisdom to politicians using the microblogging site. "My advice to any politician on twitter: Avoid unseemly spats, say nothing you may later regret and never upset the good people of Liverpool." By comparison the twitter feed is actually quite dull. Fascinating news from New Mexico where The Albuquerque Journal reports that Sunland Park Mayor Martin Resendiz claims he was drunk when he signed nine contracts with a California company that is now suing the city for $1 million. They say that Mr. Resendiz acknowledged during a deposition that he had been drinking for several hours with executives of the firm and didn't know what he was signing. It is not a story I have ever seen in relation to the UK, unless people know better. Two items in the press today and yesterday show further progress in improving the openness and accountability of government. First up is this piece in today's Guardian that a series of changes to ease the rules for freedom of information requests are to be examined as part of a public consultation designed to open up Whitehall. • Lifting the time limit. "At present, public service providers subject to the [FOI Act] can refuse to release any information where it would take more than 18 hours (24 hours for government departments) to locate, retrieve and extract that information. This time limit does not include the time taken to consider whether the information is exempt from release or to prepare it for release." • Changing the fee structure. At the moment requests can be refused if they cost more than £600. This could be increased to £1,000, opening the way for more requests to be granted. One source said: "This is designed to encourage better self-regulation on data storage by officials. If they know that more requests are likely to be granted then they will start collating information more efficiently at an earlier stage." • Exploring whether the information commissioner has enough powers to enforce FOI legislation. The document said: "The commissioner … has powers of entry and inspection in specified circumstances. It is an offence … to alter, deface, block, erase, destroy, or conceal information with the intention of preventing its disclosure. This offence can apply to any individual. Are these powers sufficient to enforce an enhanced right to data?" • Changing the law to provide statutory time limits for internal reviews. At the moment there is no statutory time limit for the completion of time review on requests for data, which can lead to delays. Second, is a piece in yesterday's Guardian, which I missed because I was on the Maes, where business secretary Vince Cable announced that he has scrapped plans to introduce the blocking of illegal filesharing websites. A consultation document, launched by Cable, said that ministers intend to do more work on what other measures can be pursued to tackle online copyright infringement in an effort to stop widespread music piracy, which is increasingly spreading to television and film. The business secretary said that people will also be able to make copies of music and other media for personal use, confirming well-leaked plans to relax the current law that makes it illegal to copy the contents of a CD they own onto an iPod or other digital device. "This brings the law into line with, frankly, common sense," said Cable, responding to the Hargreaves report on the future of UK copyright law, which recommended the changes back in May 2011. "A lot of this has to do with consumer freeedom. We need to have a legal framework that supports consumer use rather than treat it as regrettable. We can't say that businesses should embrace technology but say to consumers they can't use technology for products they have paid for." The measures in the Digital Economy Act have been particularly controversial as they were seen as penalising innocent consumers who were copying material they had paid for onto computers etc for their own use. It was also considered uneworkable for similar reasons. It was George H. W. Bush who derided Reaganomics as "voodoo economics" but I am not suggesting for one moment that Adam Price's report called 'The Flotilla Effect: Europe's small economies through the eye of the storm' has any resemblance to the supply side policies practised by the late President Reagan. However, I do think that the former MP for Carmarthen East and Dinefwr's basic thesis that people in Wales would be about 39% richer had it achieved independence more than 20 years ago, is sufficiently flakey to deserve the same sort of derision. This is serious research and deserves to be treated with respect, but my concern is that it is a piece of work that has set out to use facts to prove a thesis rather than allow its findings to be determined by the facts. Mr. Price claims that Wales' economy would have grown by 2.5% a year if it had become independent around the time of the fall of the Berlin Wall in 1989. He has come to this conclusion by looking at the relationship between economic performance and country size. He contends that in general small countries do better. What matters here is context. By all means look at Ireland and Iceland, but look too at their cost of living, look at the 50 or so years Ireland struggled after becoming independent to establish its economy and then ask whether either country can really be compared to Wales with its post industrial heritage, its structural problems and its levels of deprivation? It is certainly true that a small country can be agile and can use taxation policy for example to stimulate its economy. However, as Gerry Holtam has pointed out Wales already starts with a substantial deficit in terms of tax raised against public expenditure. And of course we do not start off as independent as many of the countries referred to. We would have to decouple. How many public sector jobs would disappear as part of that process as the DVLA for example is moved back across the border. Plaid Cymru cannot have it both ways. As Professor David Blackaby, of Swansea University's School of Business and Economics, says, although some small countries have done well, their success is not necessarily due to their size. "If you have got some natural advantage, human skills or physical resources, there's usually a reason why countries did well and it needn't necessarily be related to size." It is a good attempt at making a case for independence and, despite my own negativity towards the report, it does make an important contribution to the debate. However, I remain unconvinced. There is a letter in this morning's Western Mail that is not just wrong-headed but also misunderstands the position with regards to the translation of the record of proceedings (Cofnod) of the Welsh Assembly Plenary. The author starts by referring to the suggestion that we might be able to obtain a fuly bi-lingual Cofnod by the use of Google Translate. Assuming this was sustainable then this proposal would come in at a cost of about £110,000 rather than the £240,000 cost of using external translators. However, Mr. Jones believes that such talk demonstrates an 'English mindset'. He writes: It is pure racism for anyone to imply or to say that the Welsh language “costs money” which is as perverted as saying that the English language costs money in England or that the French language costs money in France etc. Every democratic country and anyone who knows the difference between democracy and hypocrisy would agree that the language and culture of a nation is not, and cannot be referred to in financial terms (not for sale). The only way to “save money” is for those who have been told that they can’t speak or understand Welsh were asked to pay for the translations and especially the translations of Welsh to English. What nonsense! Firstly, there is no comparison between the position of Welsh with that of French in France. France is not a bilingual country and so translation costs do not apply. Equally, because 76% or so of the Welsh population do not speak the language then any contributions in Plenary by Welsh speakers need to be translated for the record. I am not saying that this is not the situation in reverse. In principle I support a fully bilingual record but it is at this point that priorities have to be applied. Isn't it tokenism to just provide a straight translation? Would those resources not be better used in developing the language across Wales? Those are hard questions that we need to answer our satisfaction before proceeding. The fact is that public finances are finite and thus decisions taken in support of the Welsh language, whether in the Assembly or in the broadcast media have to be balanced against competing demands for that money including the health service, schools, transport and the environment. This is not a commercial argument, it is an economic one. Nor does it prejudge any of the decisions that have to be taken by the Welsh Government or the Assembly Commission. Rather it seeks to put them into context and point out that financial considerations do play a part as does value for money. What matters is that decisions are taken within the available resources so as maximise the benefit for the Welsh language. Has plain English ceased to be a skill? It is not often that the words 'well done Danny Alexander' pass my lips, but yesterday was such an occasion. The Chief Secretary to the Treasury went onto television yesterday and dismissed demands by the Tory right wing to cut the top rate of tax. Last week, Mayor of London Boris Johnson backed the move as "a signal that London is open for business". Mr Alexander told BBC1's Andrew Marr Show: "Anyone who thinks we are going to shift our priority to reducing the tax burden for the wealthiest has another think coming. That cannot be the right priority." He said the Coalition's priority had to be to push through tax cuts aimed at people on low and middle incomes. "The idea that we are going to somehow shift our focus to the wealthiest in the country at a time when everyone is under pressure is just in cloud cuckoo land," he added. He is absolutly right. This is not a Conservative Government, it is a coalition and it is built into the agreement that fairness in the way we levy taxes should be at the very heart of it. That means using what resources we have to cut taxes for the worse off, not help those whose incomes are much higer.